The Mid-Atlantic region of the U.S. is becoming an integral area for the woody biomass industry worldwide. Enviva LP is capitalizing on the North Carolina's support for biomass to plan a second wood pellet facility, this time in Northampton County. BC Hydro, British Columbia, Canada's largest electric utility, has selected four biomass projects as part of its self-prescribed clean energy initiative called the Bioenergy Call to Power. An Alberta, Canada, power plant slated for operation in 2013 will use AD to create 3 megawatts of power for sale to the grid, but will also use a unique technology to denature infectious proteins in its raw meat processing byproduct feedstock. 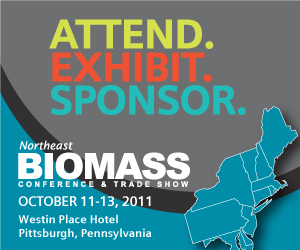 BBI International has announced the tour sites for the Northeast Biomass Conference & Trade Show, being held Oct. 11-13 in Pittsburgh, Pa. The tour sites are all engaged in leveraging biomass streams for energy production. A follow-up report to the Billion-Ton Study has found consistency with the original in terms of magnitude of resource potential under the same assumptions. But the follow up finds differences in specific feedstock availability. The 'Community Roadmap to Renewable Woody Biomass Energy: A Step-by-Step Decision-Making Tool for New Hampshire Communities' was developed to help communities determine whether woody biomass technology makes sense at a facility or district level. Washington's Clark County has hit a road bump in its plan to build a biomass district combined-heat-and-power plant in downtown Vancouver. The city has declared that the site zoning prohibits such facilities, but the county is undeterred. Working on a new project site in Green Bay, Wis., Oneida Seven Generations Corp. is still experiencing small local opposition similar to what it encountered at its first proposed site in Ashwaubenon, Wis.
Taylor Biomass Energy was not only recognized as environmentally sustainable, but it also satisfied Greenopia's rigorous rating system to receive that distinction. Secretary of the Army John M. McHugh announced the establishment of the Energy Initiatives Office Task Force at the GovEnergy Conference in Cincinnati. Ag Secretary Tom Vilsack visited a waste-to-energy bioprocessing facility under construction in Florida on Aug. 11 to announce that the USDA and U.S. DOE have awarded 10 grants totaling $12.2 million to spur research into biofuel and bioenergy crops.